Welcome to our Group Tanzania Safari, if you want to join a Shared group safari in Tanzania. You can be join our shared safaris for fun, so as to meet new people and friends on safari or just to make it affordable to you in case you are traveling alone, and you do not wish to take a solo safari. Whatever is your reason for wanting a shared safari, you should look no further. We arrange group departure safaris starting and ending at Arusha town and you can join on any day provided that we have confirmed participants for the date you are planning to start your safari. Many travelers over the years have continued requesting us for availability and possibility to join a shared safari in Tanzania and this is what prompted us to start organizing Northern Tanzania group safari tours. We need only 2 persons to have a confirmed departure and we operate the group Tanzania safaris in conjunction with some of a our trusted partners. These group safaris take you to either of the best national parks in Tanzania including; Serengeti National Park, Ngorongoro Crater, Tarangire National Park and Lake Manyara National Park. If you are interested in doing a basic Tanzania camping safari and an do it private just let us know and we shall customize a tour that will suit your needs and that of the people that are coming with you on that private tour to Tanzania. We have daily departures for a 4 Days Camping safari to Lake Manyara, Serengeti National Park and the Ngorongoro Crater. These are the highlights of Safari in Northern Tanzania. These are ideal for the last minute short safari seekers but you can also make an early booking for the date that you wish. Special Offer Price NOW at USD 200 Per person / per day Only!!! – Contact us now. Leave Arusha in the morning with a lunch box and drive to Lake Manyara National Park one and a half hours away. We will check in at the Jambo Campsite and offload the camping gear then head straight to the park for game drives all day. Late afternoon we return to the campsite for dinner and overnight. *Alternatively this Group Camping Safari in Tanzania takes you to Tarangire National Park especially in the dry months when game drives are best at Tarangire. 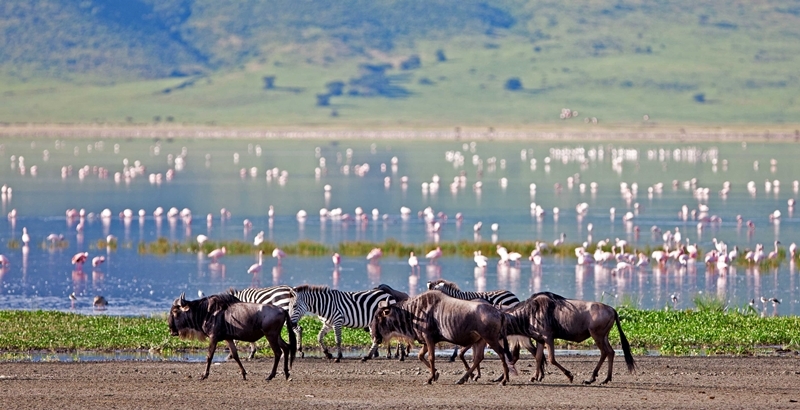 During the months of April / May travelers are encouraged to do Lake Manyara instead of Tarangire National Park. Early morning breakfast then drive to Serengeti National park crossing the Ngorongoro Conservation Area. You will be doing game drives on the way and after entering Serengeti via Naabi Hill gate you will continue with game drives the whole day. Lunch box will be served on this day as well. Later in the afternoon you will settle at the Seronera Campsite for freshly prepared dinner and then stay overnight at the Campsite. After breakfast at the Campsite you will spend the morning at Serengeti National park all morning and in the afternoon after lunch at a picnic site, we drive back via Naabi hill Gate to the Ngorongoro Conservation Area to stay overnight at Simba Campsite at the Crater rim. Day 4: Ngorongoro Crater – Arusha Town. Very early breakfast at Simba campsite then we descend early to the Ngorongoro Crater’s floor for some 6 hours of Game drives in the Crater floor. After lunch at the Hippo poolside picnic site we ascend up the Crater rim and drive back to Arusha town where the safari ends in the late afternoon. – The same safari can be done as a 5 Days Package by starting with Tarangire National Park. – The package can be combined with a Beach Extension. Just Request for unbeatable Zanzibar Offers !!. End of 4 days Group Tanzania Safari to join. A sleeping bag (can be hired for USD 3 per day), Please request if you need. Are you travelling alone and want to join our group Tanzania safari? – Please contact one of our experts by email or fill in our booking form. End of our 4-day group safari in Tanzania!